(PhysOrg.com) -- If quantum computers are ever to be realized, they likely will be made of different types of parts that will need to share information with one another, just like the memory and logic circuits in today's computers do. However, prospects for achieving this kind of communication seemed distant -- until now. A team of physicists working at the National Institute of Standards and Technology (NIST) has shown for the first time how these parts might communicate effectively. The goal to develop quantum computersa long-awaited type of computer that could solve otherwise intractable problems, such as breaking complex encryption codeshas inspired scientists the world over to invent new devices that could become the brains and memory of these machines. Many of these tiny devices use particles of light, or photons, to carry the bits of information that a quantum computer will use. "We manipulate the photons to be as indistinguishable as possible in terms of spectra, location and polarizationthe details you need to describe a photon. We attribute the remaining distinguishability to properties of the quantum dot," says Glenn Solomon, of NIST's Quantum Measurement Division. 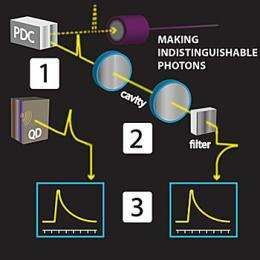 "No conceivable measurement can tell indistinguishable photons apart. The results prove in principle that a hybrid quantum network is possible and can be scaled up for use in a quantum network." Actually, the Lockheed computer uses something called 'quantum annealing' which some argue isn't really true quantum computing. 'Standard' quantum computers use quantum particles as qubits. I think that so far we have only built a system containing 14 qubits, and it's relatively unstable!